These 10 colour palettes from MaqPro Paris are the ultimate space-saver for your kit! These palettes can be used for anything, from foundation and concealers, to blushes, lipsticks and even eyeshadows-- you can create a whole look using just one palette. Made from MaqPro Paris' oldest and most popular fomulation, the Fard Crème, these palettes have a lasting power of up to 15 hours, so they're perfect for the rigorous demands of HD film and television. And because the formulation is wax-based, these palettes will last for decades in your kit, and is stable even in extreme hot or cold conditions. The PP.15 palette suits medium to dark skintones, and includes shades to suit your skintone, plus correcting and highlighting shades as well. 150, 78, 86, 146, 52, 160, 155, 7, 145, 15. 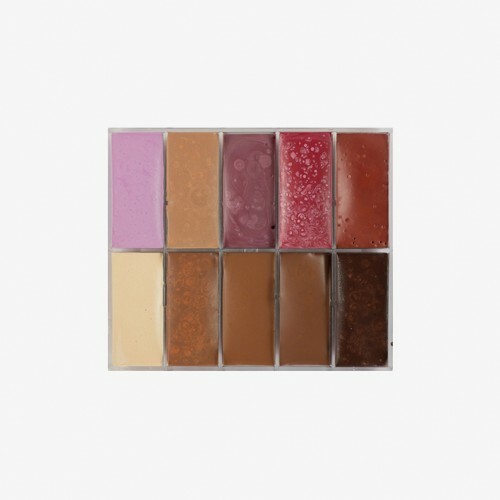 The colours available in the Skin Illustrator Flesh Tone Palette range from the palest of pink tones.. The Skin Illustrator Grunge Palette unites the Skin Illustrator colours that have been used seperate..
Kryolan's Sealer is a clear, synthetic liquid used to seal and protect prosthetic pieces made from m..
Made from metal, this palette is great for mixing and blending make-up, such as foundations, lipstic.. These 10 colour palettes from MaqPro Paris are the ultimate space-saver for your kit! These pa..